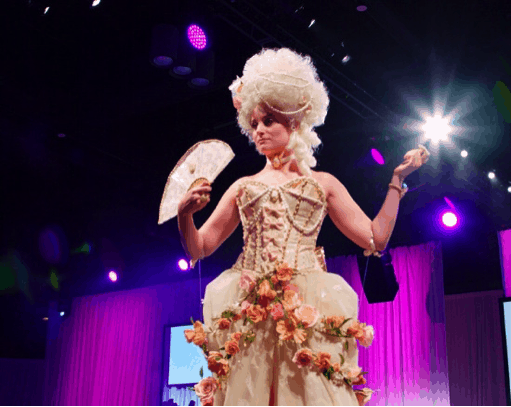 AT THE ORANGE COUNTY CONVENTION CENTER IN ORLANDO, FLORIDA- HOSTED BY SATIN ICE WAS A FASHION SHOW UNLIKE ANYTHING YOU’VE EVER SEEN! Today we are going to give a sneak peek “behind the scenes” to share some insight and fun facts of what it took to make such a spectacular event happen. Having the opportunity to watch a large Production Management Team pull it all together with lights, camera and lots of action back stage… was a show by itself! Observing the talented Sugar Artists assist their models into their costumes and add finishing touches was entertaining to say the least. The Production Makeup and Hair styling team worked their magic with over the top hair and makeup to complete each model’s look and with time to spare. The costumes for this year’s theme were inspired from “Movies & Music Throughout the Decades.” A diversity of inspired looks ranged from vintage bridal to a Rock Star with purple glitter hair, feather eyelashes and glitter lips are just a few details to mention. As show time drew closer you could sense the anticipation build from the audience all the way to back stage. The show was presented with two of Food Networks biggest stars, Emily Ellyn and Nancy Fuller. They captivated the audience by enthusiastically presenting each model to showcase their one of a kind masterpiece costumes. 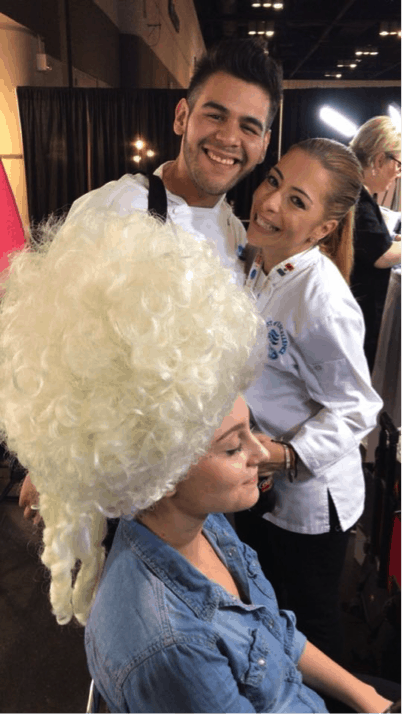 Here are some fun and informative Q & A’s of what it took for the Production Makeup and Hair styling team to make it all come together to put the icing on the cake….pun intended! Q1. What was the process of working with the chefs and making their vision come to life? A1. The actual process started months before the big day. Storyboards and sketches were sent weeks in advance, so we could plan appropriately and prepare our kits with the right products etc. 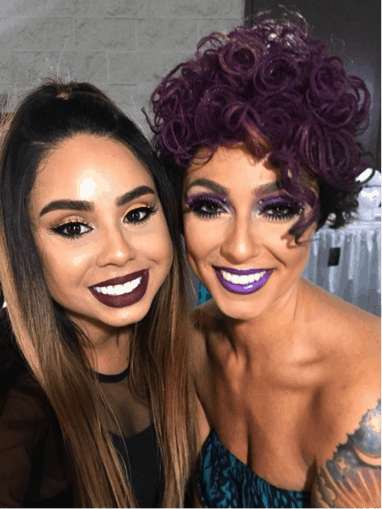 Many special wigs along with specific hairstyling and makeup items had to be ordered and shopped for to help make the completed looks for each character all come together cohesively. Also, each hairstylist and makeup artist was chosen carefully based on skill and ability to execute the specific looks. Timing and scheduling had to also be considered and meticulously figured out beforehand. It was imperative that each artist be not only be very organized, but also work efficiently so that everyone would be completely done and ready to go at show time! Q2. 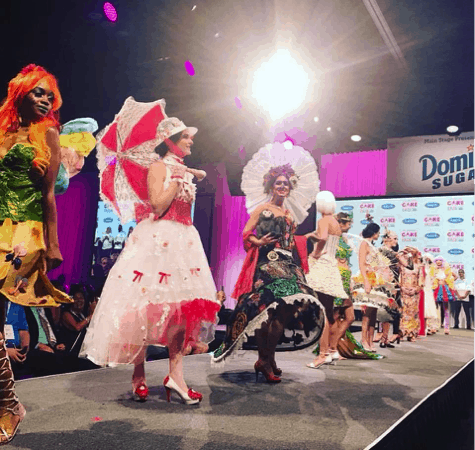 What were some of your favorite looks from the Sugar Art Fashion Show? A2. Each one of the looks were fabulous by themselves. However… if we had to pick a few favorites? Marie Antoinette, Marilyn Monroe’s “Men Prefer Blondes,” and Prince’s Purple Rain costumes were over the top amazing! Q3. How long was the whole process for makeup and hair? A3. Aside from load in and set up the actual hair and makeup services started at 1:30pm and final touches were done by 6:30pm. So basically, it took 8 artists 5 hours each…which is 40 hrs. of hair and makeup. A snapshot of the behind the scenes was fun to see as well. Getting models to their perspective hair or makeup artists work stations on time and switching between hairstyling and makeup chairs was like a ballroom dance to keep everything running smoothly and on time… and not to mention, we had several unexpected interruptions for dress rehearsals and costume fittings in the mix as well. 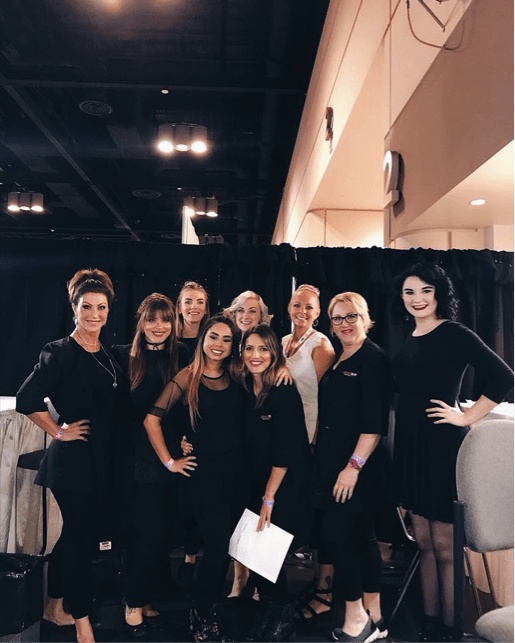 Having our “A Team” of hairstylists and makeup artists, as well as a coordinator of our own to help quarterback the whole event, really made the difference and everyone was finished right on time! Q4. How was this show unique? A4. First, it was unique that the Sugar Artists came from all over the world traveling with their costumes in tow! It was also most unique in the fact that the costumes were all made of edible sugar art which meant it had to be handled with extreme care so it did not get damaged or broken while handling. Special care had to be taken with the delicate Sugar Art headpieces and accessory pieces that had to be implemented into the various wigs and hairstyles to complete the vision. For example, several pastel colored sugar art roses and pearl strands adorned Marie Antoinette’s hair. About Face Design Team fits seamlessly into any production team.